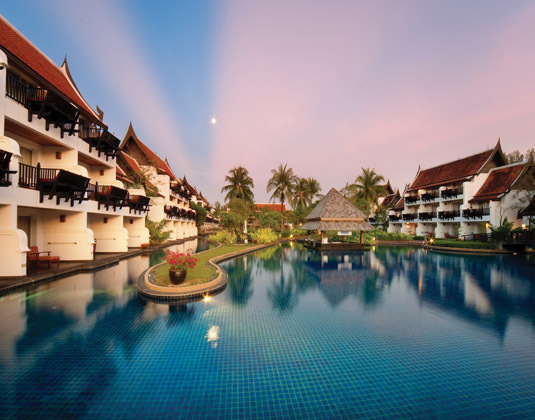 Discover the treasures of Khao Lak at this luxurious gem, which sits beside a pristine sand beach that melts into the azure waters of the Andaman Sea. Within the vast landscaped grounds you'll find Southeast Asia's longest swimming pool, which meanders its way around the guest rooms and main lobby building, a spa with indoor and outdoor treatment suites, superb dining and amenity filled guest rooms, including pool access rooms. Providing unrivalled service and comfort it's an ideal choice for couples and families alike. In deluxe lagoon pool view rooms with air-conditioning, bath and separate shower, DVD, mini bar and balcony. 1 hour from Phuket airport. 01 Apr-21 Dec 19 if you book at least 60 days before arrival. 22-26 Dec 19 |and 05-07 Jan20 if you book at least 60 days before arrival. 01 Apr 19-31 Mar 20 receive Rose/Orchid petals decoration, turn down amenities, seasonal fruit selection and guaranteed king bed.